Get Bold! Creating a Social Business Agenda! Social Media has come a long way from the early days of Facebook, Twitter and YouTube. We have all felt its impact in marketing and public relations, but the pace is accelerating and the drive to harness social tools for business process improvement is more important than ever. How does a company apply social techniques to their business to see the same advantages in customer service, HR or product development (and more!) as we did in marketing? How do companies become a Social Business? 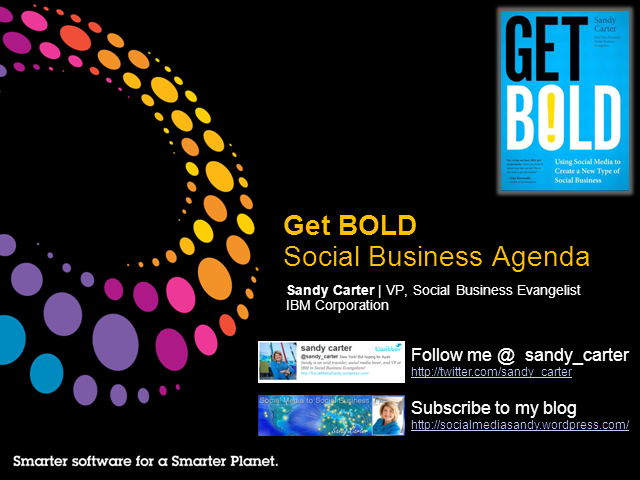 Using actionable frameworks and case studies, Sandy Carter, IBM Vice President, Social Business Evangelism and Sales, will discuss how you can create your own Social Business Agenda for greater competitive advantage in 2012. Title: Get Bold! Creating a Social Business Agenda!